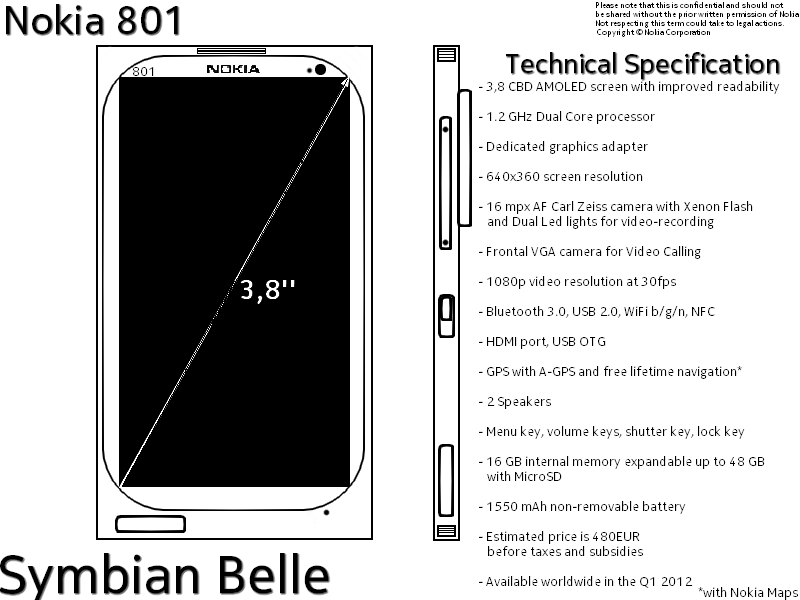 Nokia 801 – Possible 16mp Belle or make believe? Get that bag of salt and throw it over your shoulder. The same person who claimed to have info on upcoming Nokia Windows Phones – Nokia 900 – has said their source has divulged some more information. Ignore the actual MS paint design job there. That is probably just to give an idea of what it looks like. A very realistic, but extremely disappointing resolution, 640×360 nHD screen. This is supposedly going to be announced in Nokia World 2011, along with some amazing QT powered S40 handsets . The Nokia 900 is said to be launched at an event in February. The main event in February is MWC, which Nokia’s Mark Squires said they’d be going in a big way. Cheers to Jill for the tip!